I have 2 cats that love to jump on my lap and knead my belly until their satisfied to lay down. They also knead on our blankets or their own cat beds. I’ve always been curious as to why they do this, even as kittens. So, why do cats knead their owners? For cats and kittens, it’s purely instinctive. They can do this to relax, as kittens they can do this to stimulate the production of milk, and as adults, they can knead you as their territory or as a way to nest in the wild. Scientists have some ideas but no proof. We haven’t come up with a way to communicate clearly enough to ask our cats questions (assuming a cat would deign to answer them). And as far as scientists can determine, it serves no direct biological need. So we have to guess why they do it, and cats are said to be inscrutable for a reason. We have only just figured out how and why they purr (we used to think that had no biological purpose and boy were we wrong about that). That’s not even touching on how they have six senses to our five. No, they don’t have ESP, they actually have a sense organ we don’t have. Until we can figure out a way to ask cats directly, we have developed some hypotheses. There are three major ones, and I will discuss each one a bit, with comments on the one I think makes the most sense. In the wild, they would push and pat down grass for a bed, sort of the way dogs turn around in a circle before lying down. While this is possible, it doesn’t really explain why they knead for an extended period of time, nor why they do it to areas which are obviously not grass or bedding. Cats do have scent glands in the pads of their feet, and they do use these to mark. Have you ever seen a cat stand up on his hind legs and put his paws on something, and then, when you think they are about to claw it up, just slide their paws down it? This is because they are marking that surface with the pads on their paws. It’s believed that they also mark the preferred teat on their mama this way when they are nursing because they quickly develop a preference for that one preferred teat. So the kneading behavior could be marking. Human babies push with their hands as well, though thankfully they don’t have claws like newborn kittens. Kittens use both their claws and teeth when nursing, and scientists believe that the nursing process releases endorphins for the mama cat, which is a good thing – otherwise she might not put up with it all those claws and teeth. So, how does this relate to our question about kneading? According to studies, cats act differently when raised by humans or in the wild. Cats raised by humans are far more vocal. Cats in the wild don’t communicate with each other verbally – they rely on scent far more. When cats show you their backside, they are actually inviting you to examine their scent and confirm you are part of the same group. It shows trust and camaraderie to them, and they try (often!) to communicate with us with scents that we miss entirely. Cats meow to us because we are dumb (to them) and can’t communicate the way they can, so they use an imitation of our language to interact with us. Among themselves, verbal communication is limited to trills, shrieks when fighting, and purrs – and that weird clicking thing they do when they spot prey (but science still hasn’t sorted that out either). So, when cats are with humans, they behave differently and try to communicate with us on their level. Also, when cats grow up with people, they never actually grow up. Cats who grow up with humans are like Peter Pan! In the wild, female cats form a cooperative society. They join all the kittens into one group and nurse cooperatively as well as hunt and guard. 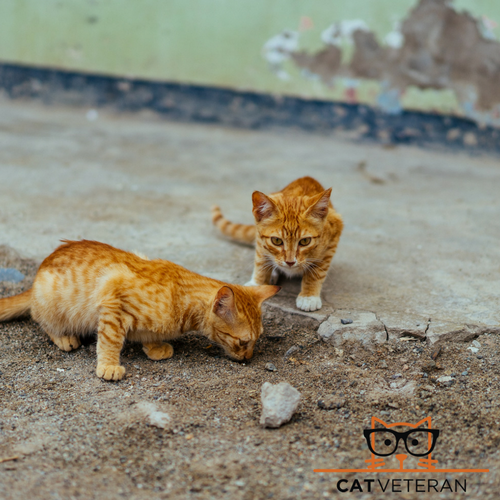 The kittens become everyone’s kittens – once joined the mama cat never separates her kittens from the group. The kittens do the same thing – they accept all the other kittens as siblings, and they bond equally to all the mama cats. They see the various mama cats nursing them and, a little later on, bringing food to them so they easily categorize all the female cats in the group as mama cat, no matter which one, their birth mother actually was. How does that tie into cats not quite growing up if they live with humans from a young age on? Well, first all the mama cats nurse and bath them. Later on, the mama cats bring them food. Finally, the mama cats teach them how to hunt, how to acquire food on their own. 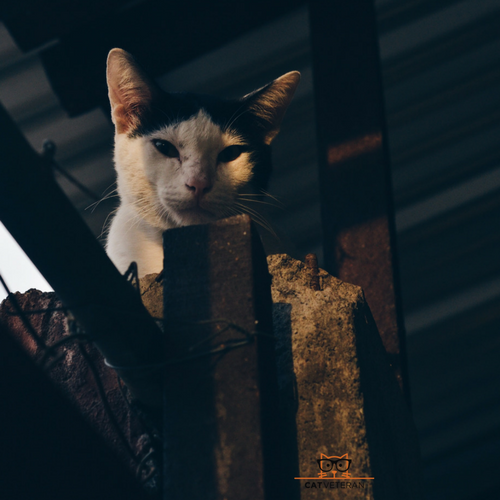 Cats who live inside with a human have no way to hunt their own food and are never taught how to – but the big mama cat (human) gives them food every day. Cats who bring you food and share it with you and don’t fight you for it must be mama cats – that’s what mama cats do, after all. So cats who live with a human come to view that human as a mama cat. A big, weird smelling mama cat who has some serious fur loss issues and a nonworking nose, but still a mama cat. By living with a human who provides all the food, these cats never quite grow up – they remain in perpetual youth, like Peter Pan or a character in Twilight (but less sparkly). They pretty much get to “tween or teen-agerhood” and stop there. Yes, your indoor human raised cats are permanent teenagers. Maybe when they destroy something or make a statement by pooping outside the litter box, they are just being rebellious, angsty teenagers. At least they can’t borrow the car, and you don’t have to have an awkward talk about puberty with them, right? Conversely, cats who haven’t been raised with humans have different needs. They need toys and activities that address their drives, such as hunting and climbing. There are a variety of interaction toys that do this, and a more independent adult cat may need some around the house, or your feet may be stalked and your couch may suffer the consequences. So, the conclusion we draw is what? To me, kneading as leftover behavior from nursing – and possibly marking at the same time – makes the most sense. If cats raised by humans are perpetual children, then kneading us makes sense. If we are mama cats to these perpetual children, then kneading us for comfort or just as familiarity because you are mama makes sense. Cats can’t say I love you or get you a present for Mother’s Day, but they can knead you (and possibly nurse that area) and purr. They are remembering the good old days when they were babies and expressing their love for their mama cats, and you are one of those mama cats. This is why they may knead several members of the household. If you all provide food and have similar scents, you must all be mama cats. Sometimes, the nursing cat gets a bit enthusiastic with the kneading and it gets a bit painful. This happens to (actual biological) mama cats, in which case they will move away or push the kitten away gently but firmly. You can try doing this or just remember that they are telling you that you are a great mama and they love you. Remember, as the old saying goes, sometimes love hurts. Awesome post. This makes total scense….lol. 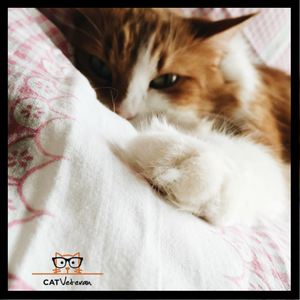 Our family calls kneading “Happy Paws’ because our cat seems so happy and comfortable doing it.